Writing or updating mission and vision statements can be a frustrating “design by committee” process. The people involved have to navigate two different tasks – picking the right ideas to include and picking the right words to communicate those ideas. Without a clear process, the two tasks get mixed up in committee meetings, causing confusion and setbacks. Picking the right words is always difficult. Good writing is an art. But picking the right ideas doesn’t have to be frustrating. A theory of change can help an organization focus on the right ideas to include in their mission and vision statements. A theory of change is a diagram or narrative that describes the outcomes an organization strives to create through their work and the relationships between those outcomes. We often start a theory of change process by asking, “What are the big problems this organization is working to solve in the community?” and then describe what a solution to those problems would look like for the people affected. A theory of change has many benefits for an organization. It is particularly effective at jumpstarting a mission and vision rewrite because it creates a lot of possible ideas to use in the statements and organizes them. Let’s look at a case. 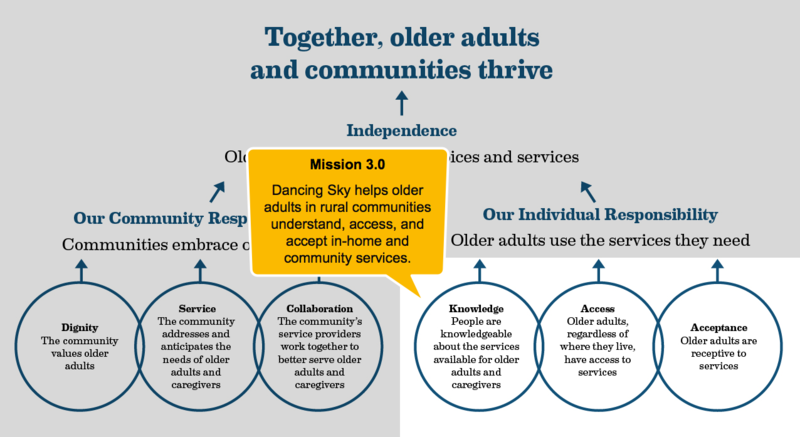 Land of the Dancing Sky Area Agency on Aging asked us to facilitate a theory of change process with their staff and then use that work to inform strategic planning and a mission/vision rewrite. The staff created their theory of change first. You can see it below. 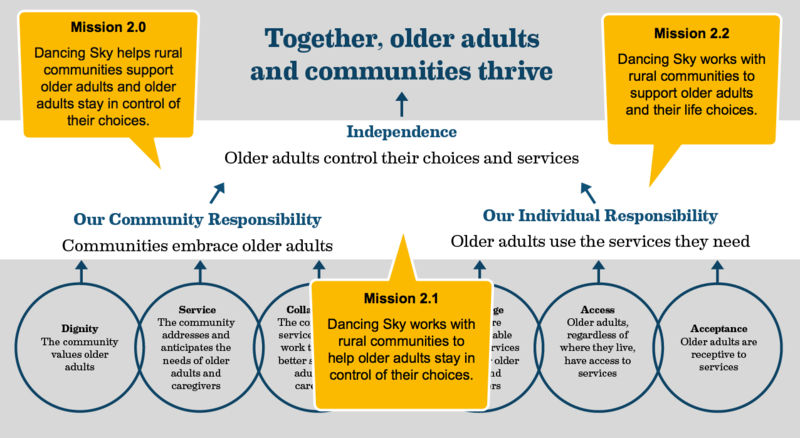 At Dancing Sky, our vision for the people of Minnesota is simple: Together, our older adults and communities thrive. When older adults thrive, their communities benefit, and thriving communities benefit older adults. We believe that both the individual and the community have an important role. With individuals, we are working to increase knowledge, access, and acceptance of services for older adults and caregivers. 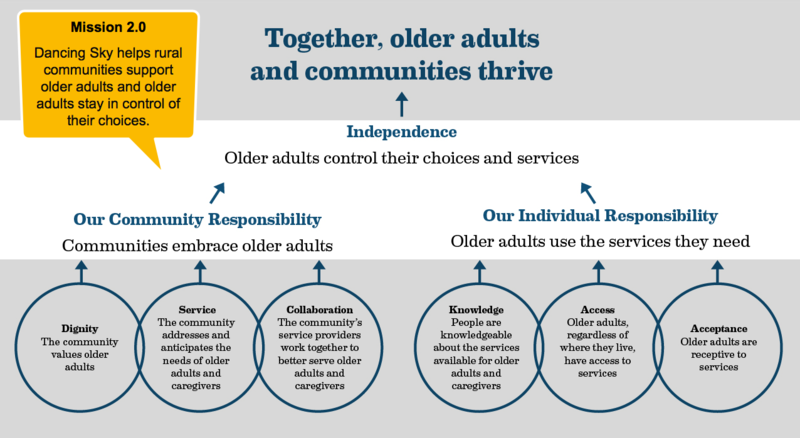 When people know about the services available, have access regardless of where they live, and are welcoming of them, older adults and communities thrive. With our communities, we are working to instill the values of dignity, service, and collaboration. 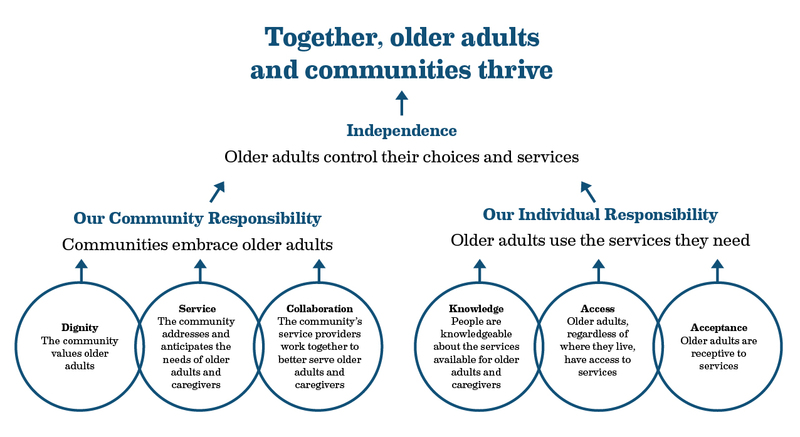 When the community values older adults and caregivers, addresses their needs through comprehensive services, and works together to provide better service, older adults and communities thrive. During this work the staff talked about all the different problems the organization is trying to solve and then flipped those problems into outcomes. What you see on the diagram are the outcomes. When it came time to update the mission and vision statements, our work was simple. The staff had already agreed on the outcomes of their organization. Our task was now to pick the right ones to include in the mission and vision statements. The vision statement was the easiest. The staff selected the top outcome on the map and called it their vision. The mission statement took a little more work, but it progressed quickly. First, Aurora wrote three versions for review. Each of the three mission statement versions focused on a different part of the theory of change highlighted below. The team selected mission version 2.0 as the closest to what they wanted. They liked the ideas in version 2.0 and we provided two more drafts of those ideas with different wording. In the end, the staff selected version 2.1 as their mission statement. 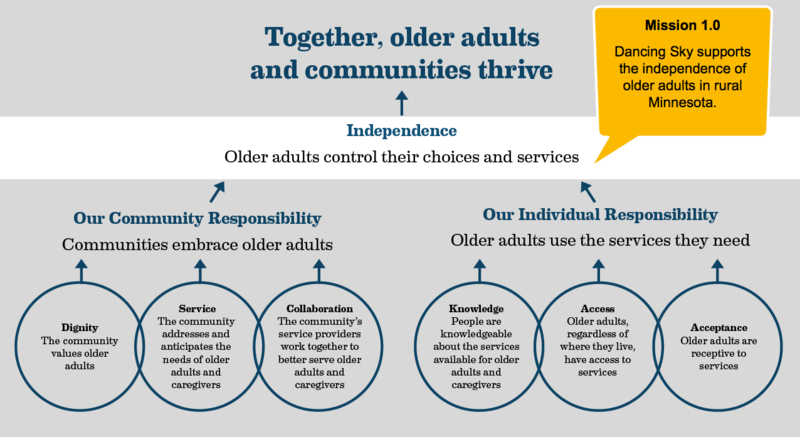 to help older adults stay in control of their choices. I love using theory of change to create mission and vision statements. It’s a natural fit and addresses some of the frustrations we see when organizations try to create these statements from scratch. A theory of change helps a group separate out the ideas from the words in a mission statement. Once the ideas are identified, then the words can be selected. A theory of change is also an inclusive document. It has a lot of ideas in it at different levels. Often in mission and vision statement meetings, the participants argue about what to include or not include in the statement. Typically, all the ideas are right in the sense that they are important to the organization, but only one or a few can go in the statement. When an organization has a theory of change, the ideas that aren’t in the mission or vision statement have a place to live and aren’t forgotten.